A small whirlpool in a pond. By Shutinc – Own work, CC BY-SA 3.0 Spiral galaxies IC 2163 and NGC 2207. X-ray: NASA/CXC/SAO/S.Mineo et al, Optical: NASA/STScI, Infrared: NASA/JPL-Caltech. Scale is one of four core themes for the BHP course, the other three being thresholds of increasing complexity, collective learning, and claims testing. Throughout my year-long course, I look for opportunities to connect back to and demonstrate the usefulness of these themes when exploring topics in history. A knowledge of scale allows students to understand and explore perspective and point of view. How we understand events, change over time, and human expression relates to the choice of scale as parameter. In May 2012, National Geographic circulated a poster as a supplement to an edition devoted to the Civil War. One side of the poster featured “1863: Turning Points of the Civil War”; the other side, “Civil War to Civil Rights.” The second side included three timelines: One identified 15 individuals who transitioned from plantation to freedom. One highlighted the concentration of African-American populations in the U.S. in 1860, 1930, 1960, and 2010. And one listed events connected to slavery and civil rights from1526 to the 2000s. Any one of the three timelines may engage young learners effectively, launching them into research and inquiry. The value of the poster, however, is the conveniently displayed amalgam of historical information, in which individual biography, regional population growth, and world events are not viewed in isolation or as detached experiences, but may be understood within new contexts, relevance, and connections. Small scales tell one story; large scales tell another. Negotiating between scales may illumine new, more relevant narratives of our human experience, our world, even our Universe. The poster does a good job of modeling scale. Unit 1 of the BHP website includes an Investigation that poses the question, “Why do we look at things from far away and close up?” This Investigation uses the dynamic of scale as parameter, and offers an opportunity for student investigators to be led to a particular observation or conclusion because of their choice of scope. Considering scale reveals that as the scale changes, the understanding or perspective of inquiry may change as well. Another opportunity to present such illumination is Unit 7, “Agriculture & Civilization,” which includes the 20-minute H2 video, Weapons. The large scale perspective of this presentation is “Humans engage in warfare from a distance, as opposed to other species, which engage in immediate proximity to each other.” The video supports the claim by focusing on human biology: our bodies have pathetic teeth and claws, yet shoulder structures that provide an advantage for throwing objects. The video gives examples of how our collective learning fuels new methods and inventions in support of our “fighting from a distance,” which progressed from rocks and sticks, to bow and arrow, to missiles and drones. A large scale, indeed, provides a view from 40,000 feet. What’s a more immediate view? A small-scale inquiry may direct students to an understanding of warfare. 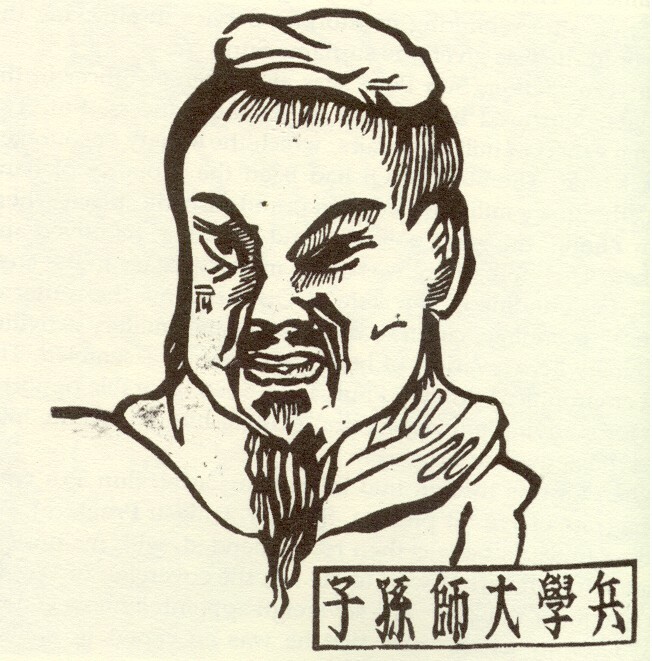 One focus from classical China would be Sun-tzu (c. 551 – c. 496) and his classic treatise The Art of War. This work is over 2,500 years old. The style of writing is simple for today’s students, yet more complex than writing from earlier periods of human history, as language has evolved from cave painting, pictographs, hieroglyphs, cuneiform, and early alphabets. The actual “books” from this period are fun for students to see–bamboo wood fastened together with cord and decorated with Chinese symbols and script. Greek hoplite and Persian warrior fighting each other. 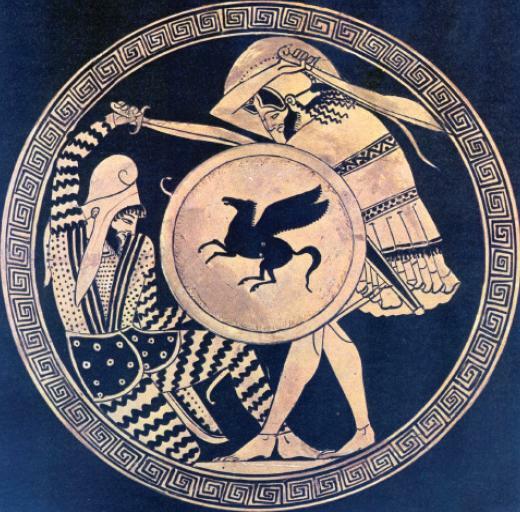 Depiction in ancient kylix. 5th c. B.C. National Archaeological Museum of Athens. By Άγνωστος – Εθνικό Ιστορικό Μουσείο, Αθήνα, Public Domain. In addition to the story of Sun-tzu, high school students may review the Persian Wars, identifying the understanding of warfare on the part of the Persians under Cyrus and later under Darius and Xerxes, as well as on the part of the victorious Greeks. Chariots and bows and arrows of the Persians create advantages through distance, yet the armor and phalanx tactics of the Greeks proved superior. The Persian Wars may offer a counter example of distance. I think that students must hear the stories of these two scales—the broader view offered by the H2 video and the more immediate-scale examples from the classical age—in order to get a feel for different perspectives. The ability to work with context, through practice with these and other stories, models well the work of historians and historical inquiry. One scale, though edifying on its own terms, is not enough. An interesting activity would be to have BH students design their own multiscale posters. They would be identifying various scales of time and space, and offering interpretations of how to negotiate the story of multiple time frames in compelling ways. Such an exercise may foster empathy and understanding for various viewpoints, each of which has been developed under specific contexts. Stories of individuals are important; stories of great, sweeping changes are important; the “alloy” resulting from the negotiation of these stories allows for creativity and conviction as students make a case for a new narrative. The multiple timeline poster may emerge a hallmark assignment alongside the Little Big History Project. The value of affirming multiple scales and timelines serves an additional function: the reception of world historians and others into the embrace of Big History. Stories of Sun-tzu, Persia, and Greece remain the domain of world history, but these scales are thematic components of Big History, as we work together to consider why we look at things from far away and close up.